The Reynolds "Man Angel" is a most fascinating and difficult study. Fascinating because of the shear audacity of an man-powered airship - and not by the mechanism one might think, i.e., driving a propeller using a bicycle pedal and chain arrangement! No! The Reynolds Man Angel was propelled by OARS! And the study is most difficult because though there were six or seven, "Man Angel" versions, photos of only two seem to exist, and there is a huge discrepancy in the historical record between the Reynolds oar-driven airships and the short-lived Thomas Baldwin oar-driven airship which was built and operated in the same time period (1905). In fact, the existing photos of the "Man Angel No. 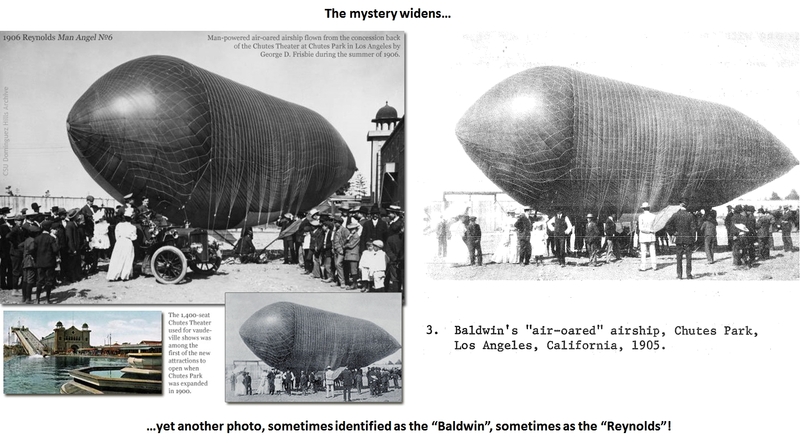 2" are often labeled as the "Baldwin Air-oared airship" and vice versa! This was a mystery for a long time as I did continued research, which I finally solved! Skip to "A Mystery Resolved", below, if you wish to read what I was able to determine. 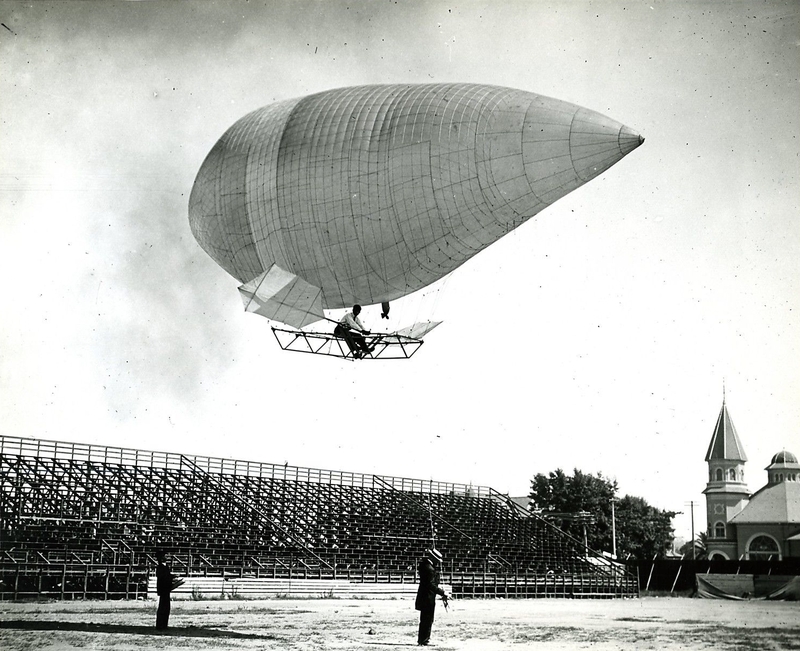 Construction of the 1st Man Angel airship, which began in March, 1905, was typical of the era. In this case, Japanese silk formed the envelope, doped with diluted "para gum" to create a gas-tight, "rubberized surface" to retain the hydrogen which filled the bag. A netting of rope surrounded the gas-bag, and suspended from the netting is a triangular framework, in this case bamboo, which became the "gondola" or "car" on which the pilot was positioned. Since the Man Angel carried no heavy gasoline engine, the hydrogen envelope could be just large enough to displace the weight of the envelope itself, the rope rigging, the bamboo frame, the oars, the pilot and some ballast. The envelope of the Man Angel No. 1 was about 36 feet long and 15 feet in (greatest) diameter. The gondola or car was about 12 feet long and wide enough to support a seated pilot, perhaps 36 inches wide. The gas envelope held 3,000 cu ft of hydrogen and the envelope weighed a mere 18 pounds. * The Jun 22, 1906 Los Angeles Herald writes of a total of 8 gas bags were produced for the an Angel project, all constructed by Alva Reynolds' wife. The article goes on to say that the 8th bag was "slightly larger than Man Angel No. 7". The larger size of the 8th gas-bag was necessary, says the article, "on account of the heavy material used in the construction of the bag." "Operations", of course, consisted primarily of demonstrations at State Fairs and carnival sites with an occasional publicity stunt established such as a race between the Man Angel and a car. A "man-powered-by-oar" airship had little practical value and was destined to be a short-lived venture! As mentioned, the record indicates Reynolds built six Man Angels and leased them to various fairs in Kansas, Arizona, and Texas where flight demonstrations were done twice daily (weather permitting of course). But it must have been quite an operation! Not only did Reynolds require a solid contract to recoup expenses and turn a profit, but the inventor needed a hydrogen generation plant or at least a hydrogen source at each operating site, in any part of the country, requiring tons of iron filings and sulphuric acid if a local supply could not be obtained. 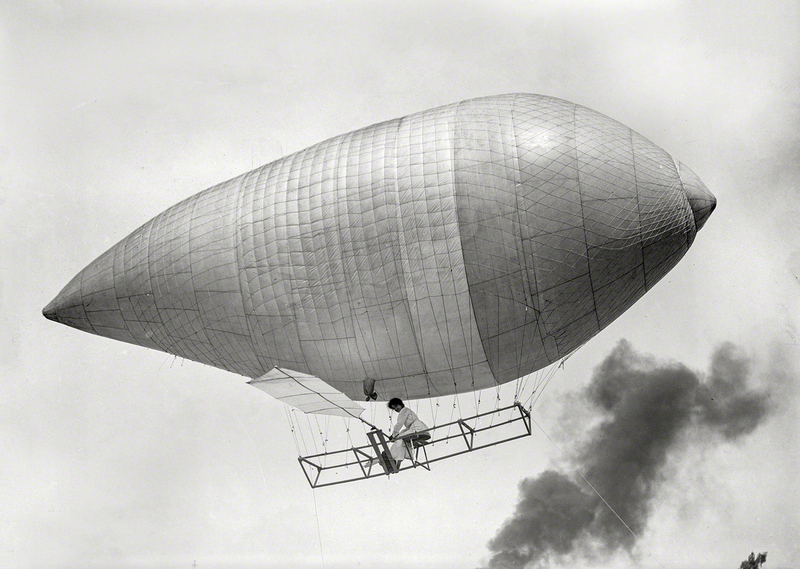 (See Hydrogen for Early Airships). Ordinarily this section describes the fate of the airship of interest. In this case, the demise of all six Man Angels is completely unknown. 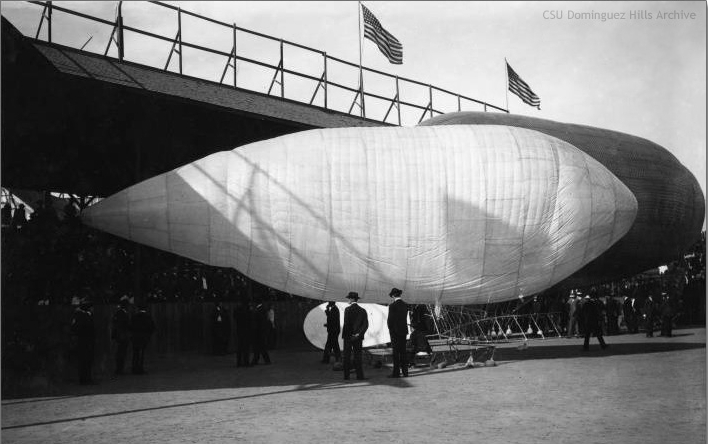 Reynolds tried to get some "competition" going, (it would have kept the activity in the public-eye and thus good for revenue), but the only other "air-oared" airship, built and demonstrated by Thomas Baldwin in 1905, was operated only briefly before it was destroyed on an unknown date in late 1905 or early 1906 when the hydrogen-filled envelope mysteriously ignited and the airship was destroyed. In early June, 1906, Reynolds tired to set up a race with an automobile to be held on July 4th. Confident his "Man Angel" would win and even put down $1,000 as prize money to be held by the Herald Examiner! It is recorded that on the day of the race, which had been delayed several times for a variety of reasons having to do with the hydrogen, finally took place on July 15th, strong winds prevented the Man Angel from making much progress, and while the race was lost, pilot George Frisbie decided to return to Chutes Park, but an oar broke and he was forced to descend and deflate the Man Angel. It is not known which Man Angel was used in the race. The Jun 23rd, 1906 reported that Reynolds intended to have the Man Angel No. 5 and the Man Angel No. 6 ready for the race. The Jun 25, 1906 issue of the Los Angeles Herald reported that the 1st flight of the No. 6 was on Jun 24th, so it can be assumed that both airships were fit for the race. The August 4th, 1906 Los Angeles Herald reports that a second race with an automobile was held in San Bernardino on Aug 3rd, and the Man Angel, piloted by Marcus Lee, was seriously damaged when it was caught on a telephone wire, then became lodged in a tree. The available record indicates that Reynolds never raced a Man Angel airship again after the failed Aug 3rd, 1906 race with the car in San Bernardino. Reynolds, the consummate "inventor" apparently left aviation and concentrated on his other ideas. Just 8 months after Aug, 1906 race, newspaper reports indicate that Alva Reynolds and his brother, George, were off in a new inventive direction. The brothers had developed a way to generate electricity using using ocean energy at a pier and by 1918, Alva Reynolds obtained a patent on a simple device to prevent barnacles and other marine organisms from attaching themselves to submerged posts (piles). While this section of "Then & Now" is intended for the "ignominious end" of the particular airship - for they all came to an unfortunate end - this particular "end" is for inventor Alva Reynolds. Reynolds, unfortunately, receives not even a "footnote" in history for his work with airships. There is no "Wiki" page for him and his date of death could not be found nor his burial place. It seems for all Alva Reynolds did, he's all but disappeared. That's ignominious indeed. A mystery quickly emerged when my investigation into the "oared" airships of Alva Reynolds. I quickly found that the same images were attributed to Reynolds and to Thomas Baldwin and vice-versa! The more I dug, the more confusing the identity! One would think that the autobiography of Guy Meckelem would clear up the issue - but it does not! 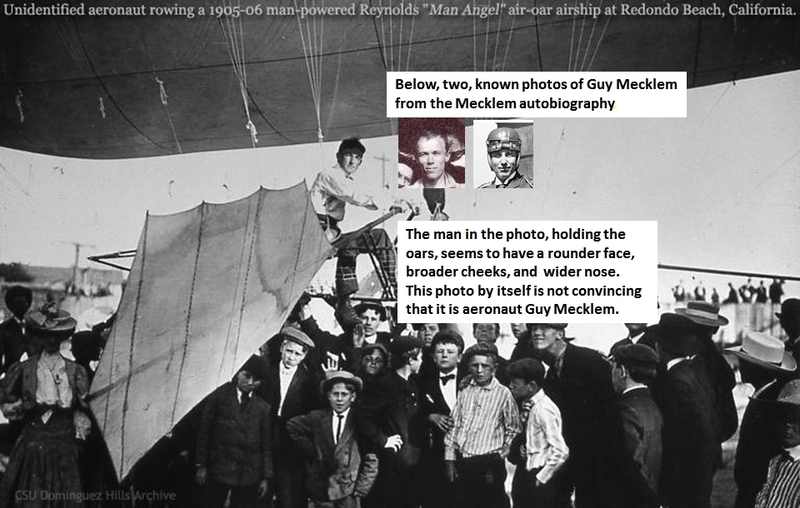 Meckelm's, unpublished 58-page autobiography shows the same photo (Figure 2, above) identifying it as "L. G. Mecklem rowing the Baldwin airship through the sky at Chutes Park in Los Angeles in 1905" - yet the same photo is elsewhere described a the Reynolds "Man Angel No 2"! How to Resolve the Mystery? More than once I tossed up my hands concluding this mystery could not be resolved. Then one day, after seeing yet another photo said to be the Baldwin 'Aerial Rowboat', I had an epiphany! I realized that the oared airship in the photo looked like the "style" of a typical Baldwin airship! Baldwin airships have a very "unique" set of discernible features which identify them! And that was the clue I needed! 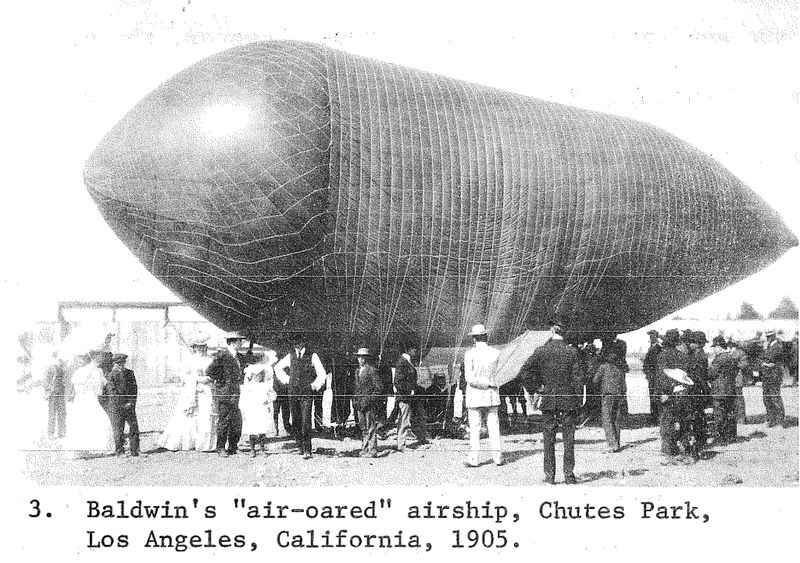 Baldwin's airships were distinct! Therefore, the Reynolds "Man Angel" airships could be distinguished from the Baldwin 'Aerial Rowboat'! A second differentiation, and I'm not going into detail of the nuances of it, is in the way the webbing of the netting is made. There is a clear difference between the netting of Baldwin and the netting of Reynolds. Moreover, the Aerial Rowboat was filled with hydrogen from the tail and the nozzle tied-off with rubber bands. [Source: Guy Mecklem unpublished autobiography.] 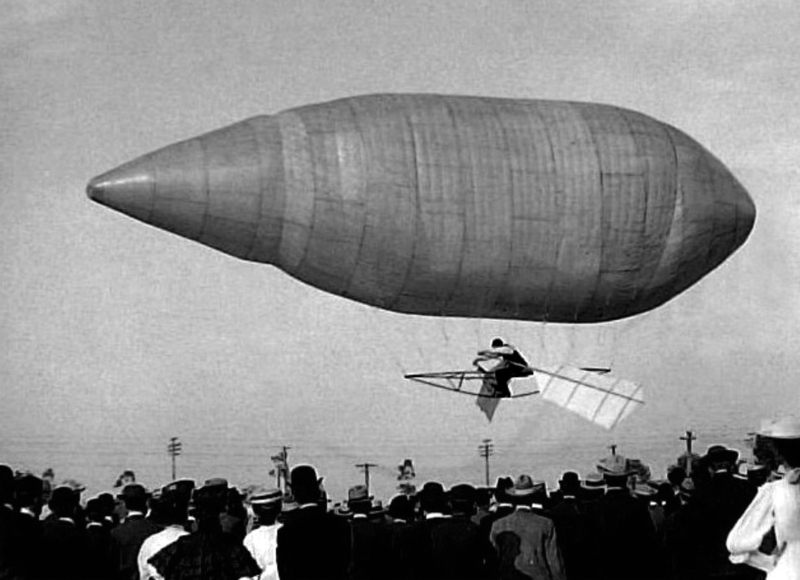 The Aerial Rowboat did not have a hydrogen fill-tube/hose positioned under the gas bag, near the pilot which was typical with most airship designs of the day. So the oft-cited photo, Figure 10 above, the closeup of the pilot on the car, holding the shafts of the oars, remains a mystery. The airship does not match the known characteristics of either the Baldwin Aerial Rowboat, nor any version of the Reynolds Man Angel. It's not the Baldwin: Baldwin made only one Aerial Rowboat, and it was destroyed sometime in late 1905 or early 1906. (I have never been able to identify the date of the incident which led to the Aerial Rowboat burning.) While the color and texture of the envelope and the ropes descending from the netting look like the familiar style of the typical Baldwin design, the Aerial Rowboat did not have a hydrogen filler tube in the middle of the underside of the envelope. The mystery airship in the photo clearly has a hydrogen fill tube. It's the Reynolds Man Angel...or is it? : While the bamboo frame/car seen in Figure 10 has the same appearance of the Man Angel No. 2, the visible part of the envelope clearly is not a Reynolds design. As mentioned, Reynolds' wife constructed all the envelopes for the Man Angels and though varying in size, the envelopes could be interchanged as needed. The gores in this airship are arranged in the longitudinal pattern and not the staggered or brick pattern that Reynolds used. Though we don't know the identity of the pilot, we can safely say it is not Lincoln Beachey, Roy Knabenshue, or Guy Mecklem. It is also not Reynold's pilot Herbert Burke. 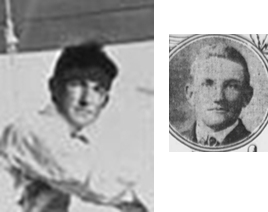 I've seen no photo of Reynolds' pilots George Frisbie, or Mark [Marcus] Lee so it could be one of those two. But as Paul Harvey would say "Now here is a strange..." The pilot in the mystery photo looks like Alva Reynold's younger brother George. Examine Figure 11, below. George Reynolds is on the right. The historical record indicates seven "Man Angels" were produced. 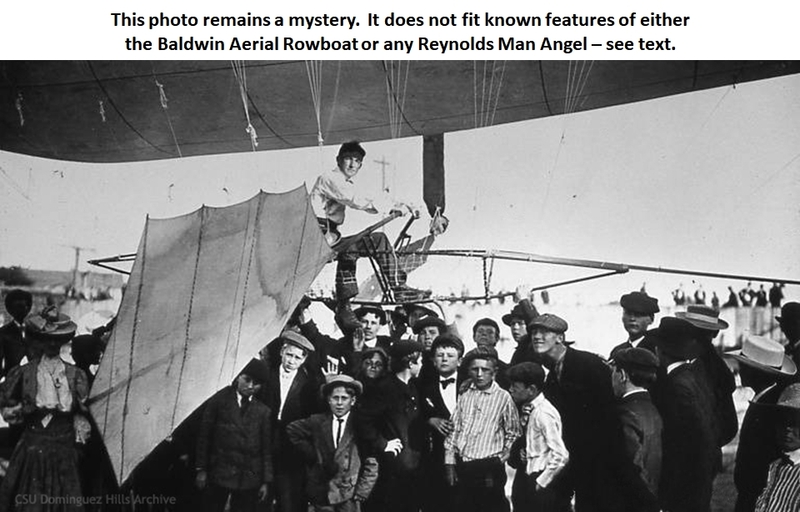 Getting passed the confusion of the "Man Angel" being identified as the Baldwin "Aerial Rowboat" and vice-versa, one quickly finds that only TWO Man Angels can be identified in photographs available on the INTERNET! These are the Man Angel No. 1 and the Man Angel No. 2. Photos of the Nos. 3 to 7 seem to not exist. As with the first photo of the Man Angel No.1, Figure 1, the No. 1 is distinctive for the "Reynolds" design of the envelope, the short "car" with no pointed ends forward or stern, and oars displaying four, clear "panels. The specifications of the No. 1 are listed in "Construction", above. Here, the craft is said to be piloted by Herbert Burke. Next, Figure 15, is a shot of the No. 2 on the ground in 1905. Note the oars are not present and there is a larger airship in the background, the Trombley-Haddock "Bullet". The design of the No. 2 is seen to be nearly identical to the No. 1. It has a nearly identical envelope, a few feet longer at 43 feet, but is a bit narrower in diameter at 14 feet than the No. 1. The "car" is of the same general design except the fore and aft bamboo poles are brought together to a point. The car is measures 13 feet long. And that's it! I've found no other photos of the Reynolds "Man Angel" airships! I'm sure they exist, and I look forward to the day someone stumbles onto this small site and contacts me with a new photo, perhaps of the No. 3, 4, 5, 6, or 7! The photos of the Man Angel No. 1, above, were shot from Fiesta Park in Los Angeles. Fiesta Park was a grandstand/sports/entertainment venue in what was South Park, Los Angeles, California. 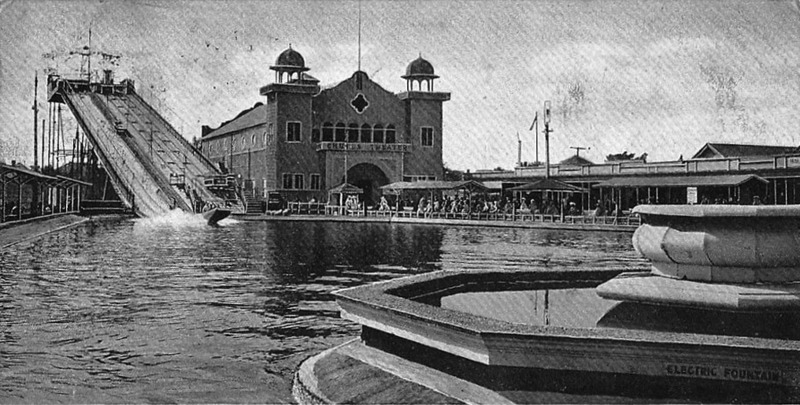 From 1894 to 1916, Fiesta Park served as a location for a variety of exhibitions and festivals, as well as a field and track meets, ball games, car shows, and unique demonstrations such as man-powered airships! 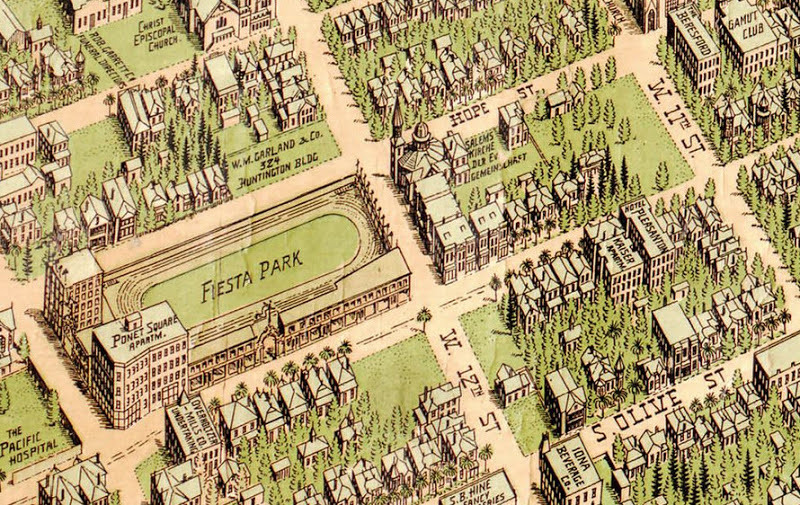 Fiesta Park was located in an area bordered by Grand Avenue on the south, 12th Street on the east, Hope Street on the west, and Pico Boulevard on the north. In 1901, President William McKinley was an honored guest at Fiesta Park for an event during a trip to California. 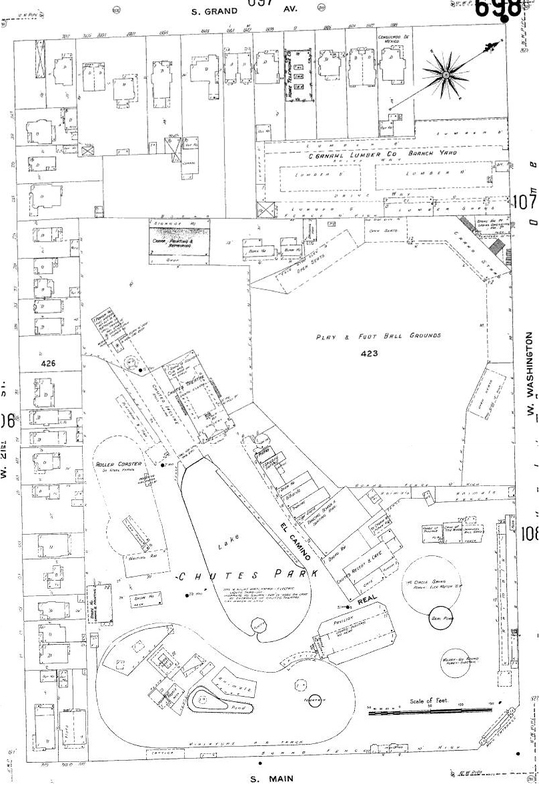 In the map image below, note the church at Hope and 12th St, (across the NE corner of the park). This same church is plainly visible in the photos of the No. 1 in flight over Fiesta Park! Figure 16. Photo credits: 1909 Los Angeles map. The location of the airship flights is (Lat Lon) 34.040310 -118.264439. 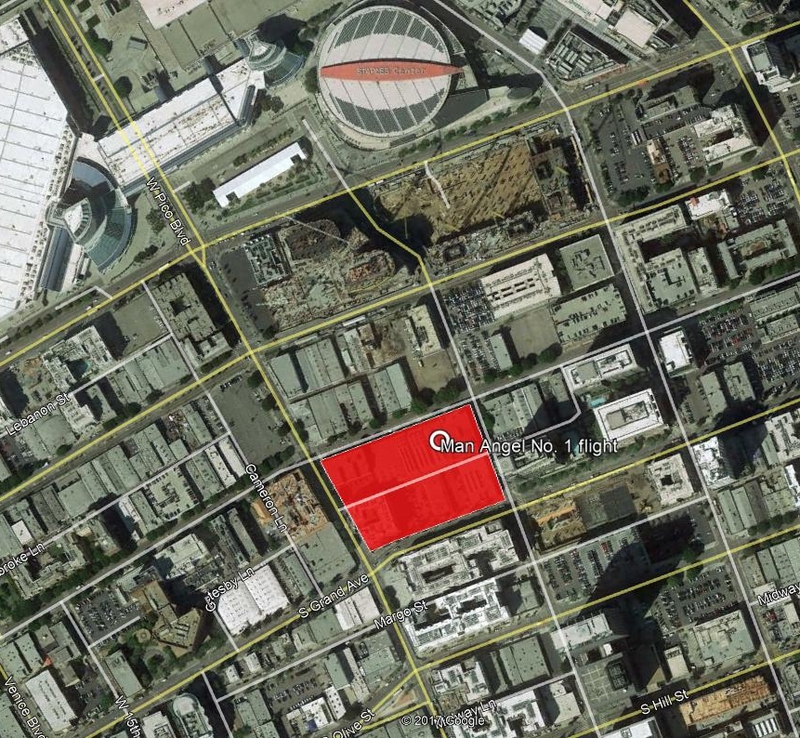 Notice the proximity of the modern-day "Staples Center" (circular building, top-center of the image above) just 2 blocks north of the location of the historic flights of the Man Angel No. 1! Photos of the Man Angel No. 2 were taken from "Chutes Park", an amusement park in South Park, Los Angeles from about 1900 to 1912. 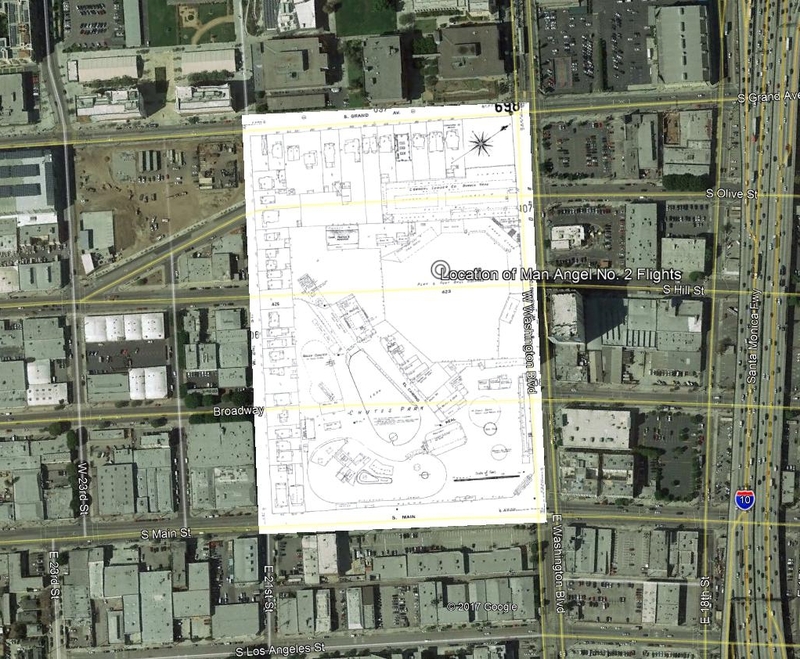 If interested, you are directed to Chutes & Luna Park - Los Angeles - 1900 - 1912. From the perspective of the photo above, flights of the Reynolds Man Angel No. 2 took place from the area behind the "strip" buildings in the middle-right of the photo. Beyond these structures was a large baseball field. Click to return to main page.